The main purpose of adipose tissue is to store energy that the body can use later. However, it can also be used by a living organism for insulation in cold temperatures or cold climates. What is Adipose Tissue Made Of? There are two main types of adipose tissue; white adipose tissue (abbreviated to WAT) and brown adipose tissue (abbreviated to BAT). The white adipose tissue is responsible for storing energy in the body and the black adipose tissue is responsible for generating heat for the body. Why Do We Have Adipose Tissue? Times have moved on to see most of the developed world not having a huge issue with starving to death. Our bodies, however, have not evolved much since the medieval times or even as far back as the stone age. Back in those time periods, adipose tissue worked as a mechanism to store food for the future, in case of famine. For example, people could over eat during the harvest seasons to stock up on fat – stored as lipids within the adipose tissue – that they could burn for winter periods where food may not be as bountiful.In most parts of the world where starvation is no longer an issue, adipose tissue now serves to keep us warm or to release certain hormones into the body. In 2004, it was discovered that adipose tissue has been found to be a major endocrine organ. What this means is that the tissue produces hormones such as cytokine TNFa, leptin estrogen and resistin to serve as part of our body’s chemical messenger system. Besides this, the adipose tissue can synthesize the fat from the extra carbohydrates and extra proteins in our diet, to store this energy for later use. Where Is Adipose Tissue Located? Adipose tissue is located in several places all around the human body. In different forms of animal life, the tissue is stored in different places.In humans, adipose tissue can be found in layers under the skin for the most part. However, the tissue can also be found in between the body’s different muscles, around the heart as well as around other important organs and in the abdomen. Every person will have adipose tissue in different locations around the body, as where the tissue is stored relies on various factors.As expected, one of the factors that affect the location of this tissue is genetics and your genetic inheritance from your parents. Due to this, humans cannot effect what adipose tissue is burned during the use of the stored lipids.It is also not possible to influence where the tissue is stored in the body, as this is also down to genetics. Adipose tissue has been identified to exist in two forms; the white adipose tissue and the black adipose tissue. The white adipose tissue – or white fat cells – are the most common type of fat cell in the adult human body. The white fat cells are unilocular, meaning that they exist in a single, larger variant of the adipose droplet that measures around 100um or more.The brown adipose tissue – or brown fat cells – are more commonly found in new-born babies or in hibernating animals in large quantities. The brown fat cells are multiocular and they exist in multiple, smaller adipose droplets that they white fat cell.In adults, these brown fat cells are found in a few areas limited to the kidney area, as well as in the aorta and the neck area.Brown fat cells can also be found in the cavities between organs in adults. Why Do Humans or Animals Get Fat? 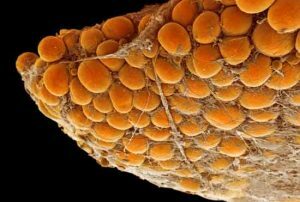 The development of obesity stems from having too much white fat cells in the body, as these cells store spare energy. When a person over eats, the extra quantities of proteins, carbohydrates and consumed fats become broken down. In the case of diet related fats, these fats become broken down into fatty acids and glycerol in your stomach and intestines. From here, these chemicals are processed by the adipocytes into adipose tissue. Due to the physiology of the human body, this extra energy that is sourced from eating more food than your body needs is turned into white fat cells. This ties into the previous point in which energy can be stored by white fat cells. People become fat when they have too much of these white fat cells storing energy for them, with no way to burn that energy that becomes stored.Over time, the white fat cells will accumulate to make a person or animal over weight, and potentially obese if they continue eating too much. What Issues Can Adipose Tissue Cause? The presence of too much or too little adipose tissue can cause health problems to occur in humans and animals alike. In humans, too much adipose results in obesity and obesity can cause health complications. Some health complications associated with too much adipose may be: developing type 2 diabetes, as too much adipose makes the body resistant to insulin.A resistance to insulin can cause blood sugar to become unregulated, leading to blood sugar issues. Having a body with not enough adipose present can be serious. 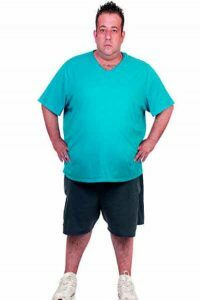 This condition is known as lipodystrophy, which refers to a body that is not able to produce enough adipose. Due to the low levels of leptin that can be associated with low quantities of adipose, Osteosclerosis can develop as a direct result. 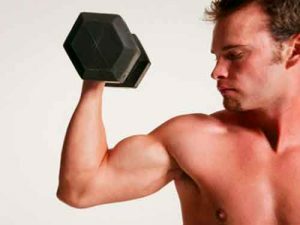 For these reasons, it is important for a human being to produce the right amount of adipose. Too much or too little adipose can result in long term health disorders and potentially irreversible damage to the body. In conclusion, adipose comes in two forms: white fat tissue and black fat tissue. These tissues are used to keep us warm, store away energy for later use and to pad the body from potential injury.A lack of adipose or too much adipose is bad for the body and humans should strive to control their adipose tissue quantities.